Sometimes I like to eat the same thing over and over and over again. It's comforting. It's easy. But sometimes, sometimes it can get just a wee bit repetitive. When you live alone and cook for one, it’s easy to forget how much fun it really is to cook. You get bored. You get lazy. You eat out. You spend all the money you don't have. And worst of all (yes, worse than going broke), you ended up throwing out half the groceries you bought. Well let me tell you I ain’t here to preach. But I am here to help you waste less, get more bang for your buck, AND remember just how rewarding it is to be curious in the kitchen. The game? How far can you take one ingredient, how many times can it evolve. The goal? To have fun. Oh and waste as little as possible. Tips and tricks: big batches to start off the week make perfect lunches, and great starting points for our game. No need for an endless supply of herbs and spices (as much as we might like). Don't spend money and time on stock when your stock sits in pieces in your fridge: in stalks, in carrot tops, flavour packed onion peel you can find in your grocery store for free – no, not stealing, free. Starting my first ever public post on the 1-Week-1-Dish Challenge (so bare with me as I see how this goes...). nibs etc. original recipe. Serves 3-5. For the spelt: rinse 3 times, then into your pot place faro, water, onion peel, garlic – smashed and peeled – peel included, kale stalks, cut into 3 inch pieces, teaspoon each of salt and pepper. Bring to a boil, then cover and simmer for 30-40 minutes. Meanwhile, peel, clean and char your corn on the stove (or bbq), rotating by hand for about 5 minutes, about 1 inch above the flame until kernels are deep yellow, and at least 50% has a slight dark/black char. 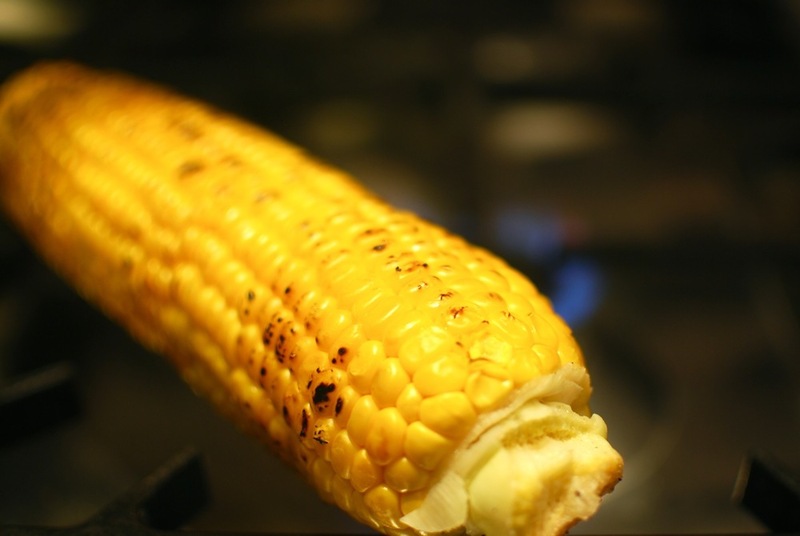 When cooled, run a sharp knife as close to the core of the corn on the cob as possible, shaving off every remaining kernel (and nibbling any remaining corn off the cob as a pre-dinner hors d’oeuvre. Soft boil your eggs (place into boiling water for about 7-8 minutes), and chop when cooled. Chop your tomatoes into corn kernel sized pieces. Rough chop your capers, and finely cube your cheddar into caper sized pieces. Set aside until spelt is ready. Once spelt is soft but with still some bite left, remove the lid, turn heat on high and evaporate off any remaining water. Then turn off when only a couple of tablespoons remain. Remove and toss your onion and garlic skins. Carefully (hot!) remove your kale stalks and save (yes save, we’re not done with those yet), for later. Into a big bowl toss your spelt, charred corn, egg, tomatoes, capers and cheddar. Top with a tablespoon of brined caper liquid, a drizzle of olive oil (and balsamic, if you feel so inclined), cracked pepper and roughly chopped fresh coriander leaves. Alright fine, they're not quite chips (french fries for the rest of you) as we know it. But if we had the time and resources, they totally could be. Heat 1 tbsp olive oil in a pan on medium-high heat. Once warm, toss in your boiled kale stalks, paprika and freshly cracked pepper to taste (and a pinch of salt if not already salted from boil). Toss to coat evenly in paprika and oil. Pan fry until starting to char and crisp on the edges (5-7 minutes). To serve, plate freshly fried kale stalk chips, top with a couple of tablespoons of last night's spelt salad, a dollop of plain yoghurt, freshly cracked pepper and olive oil. Ta-da. You're 10 minute lunch is ready. (Or if prepping in the morning, toss it all into a tupperware and whip it out at noon like the efficient packed-lunch-er that you are). Because that is what I decided it looks like… Managed to catch this week’s episode of Jamie Oliver's Jamie's Super Food, and as always, came away 1000% inspired, and with a few new tricks up my sleeve. Like the grating of cheese onto a hot pan for a little extra crunch, colour and flavour. Genius. Simply genius. So I adapted it to fit in nicely with today's 1 Dish 1 Week Spelt Salad day 3 evolution, and made a little newly-invented egg-taco (yes this is a thing and you won't understand why you never made it before). Thoroughly whisk your egg in a bowl and set aside, ready to use. 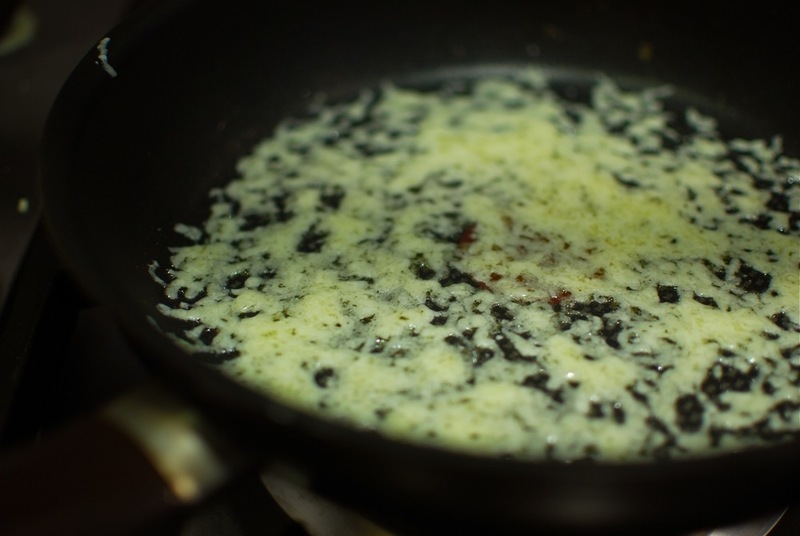 Place a pan on medium heat, with a teaspoon of butter, and allow to melt slowly. Once just melted, swirl to coat the pan, onto which you will then gently pour your beaten egg, forming a thin even coating (I used a 22 cm pan – non stick is very helpful! ), and allow to cook through slowly, until stiffened – about 2-3 minutes. Carefully slide off onto a plate, evenly distribute your grated cheese to form an even layer across the bottom of your pan (should be mostly covered with a thin layer, with the pan coming through in places). Then with your hands or a spatula, carefully flip your egg-crêpe (not yet taco) back into your pan, uncooked side down. Pour your spelt salad over half the ‘crêpe’, and allow to heat through the egg, while the cheese melts and browns underneath. 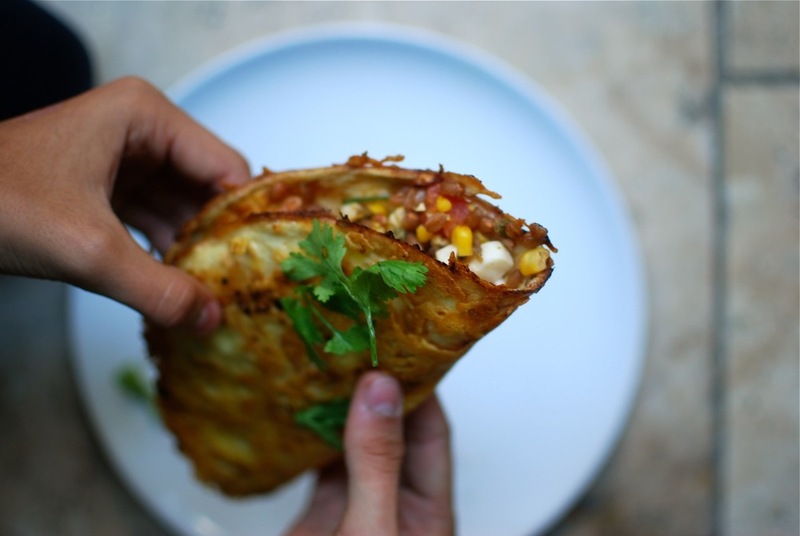 Just as you start to smell a slight smokiness from the browning of the cheese, fold over the salad-less half, hence forming your ‘taco’, turn off the heat, and slide off the pan – the outside should be evenly golden, crisp around the edges, and stiffening all over. Slice in two, serve with a fresh coriander (parsley/herb) garnish, and consume immediately. Kept it real simple today. But simple is good. Don't be afraid of simple. De-stem your kale (you know what to do with them stalks! ), and wash thoroughly under hot water – the heat I have found removes that strong kale bite, just enough, without always needing to blanche it. Squeeze as much water out as possible, and tear/rough chop. In a bowl (or Tupperware…) toss your kale, top with Spelt Salad, a drizzle of extra virgin olive oil, touch of balsamic, and a healthy serving of freshly cracked black pepper. Voila. Lunch is served. Remember those veggie boats we talked about way back when? (If you don’t, you should perhaps consider following nibs etc. on instagram…just a thought?). Well, turns out they’re a perfect way to spruce up a cold (or hot) salad. Maybe you spontaneously have some folks heading round for dinner. Maybe it’s dinner for one on a Friday night because you’re absolutely knackered. Maybe you just like saying veggie boats. 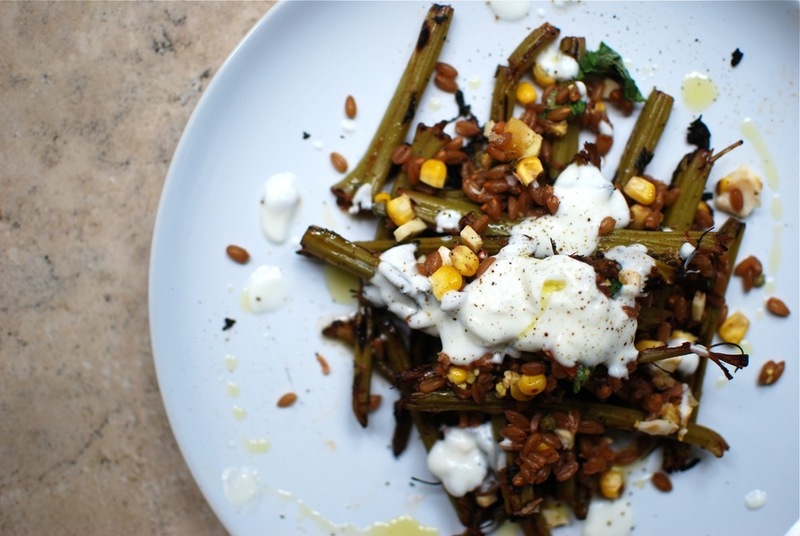 (Maybe also a great way to use up those vegetables, say bell peppers, aubergines, tomatoes, and catch them just before they reach the point of no return (aka your compost bin) – it’s amazing what a little roasting can do). Heat oven to 200*C/190*C fan/410F. Slice your courgette (or alternative veggie boat) in half. Drizzle with 1 tsp olive oil, sprinkle of salt and pepper. Roast for 20-30 minutes (until starting to turn a nice golden brown around edges/on top). Remove from the oven, carefully scoop out the centre - DON’T TOSS – and place in a bowl with your spelt salad. Mix well – note your hot vegetable flesh will warm your salad through just enough for serving. 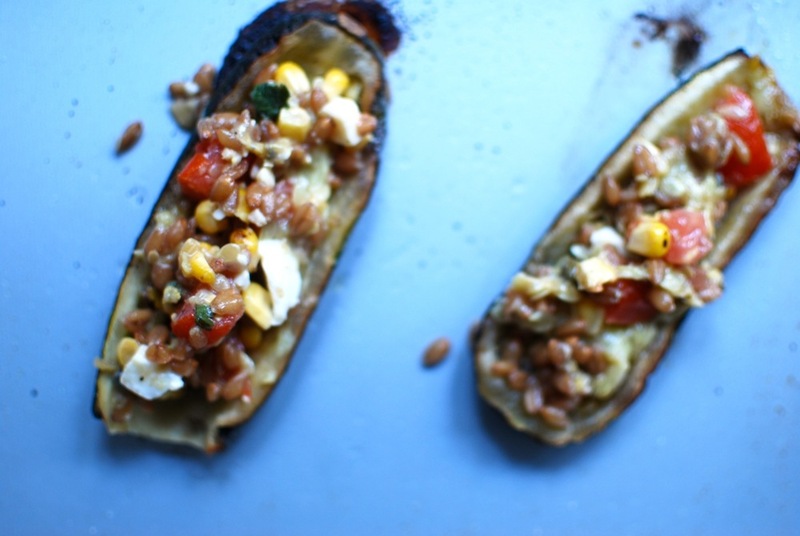 Then carefully fill your veggie boats with spelt salad, top with sprig of fresh coriander, and serve hot. Because, I like brunch way too much to only eat egg-topped avocado toast on the weekend. Toast your slice of bread to perfection. Scoop out avocado flesh halves and place face down onto top side of toast. Mash gently down with the back of a fork until your toast is evenly coated. Season lightly with salt and pepper. In a sauce pan, fry your egg. 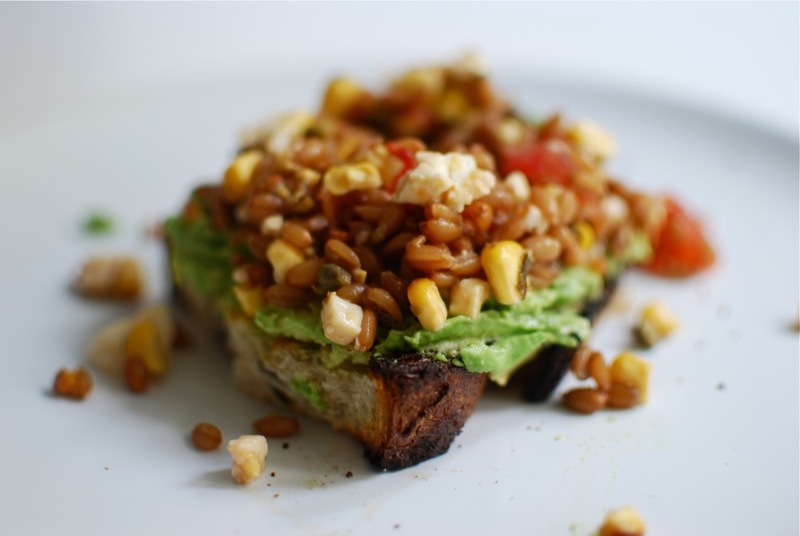 Meanwhile, top avocado toast with your spelt salad – it doesn’t have to be particularly neat. And when your egg is cooked to your taste (I’d recommend a slightly runny yolk for this one), nestle atop your spelt salad. Sprinkle with salt and pepper, drizzle with peppery (or regular) olive oil, and serve. You know the drill. Now it's your turn… tag your creations #nibsetc1Dish1Week !